Congenital Diaphragmatic Hernia (CDH) is a birth defect that occurs when the diaphragm does not fully form, allowing organs to enter the chest cavity preventing lung growth. CDH strikes 1 in every 2500 babies1, of all races, religious backgrounds, and financial status – no matter how well the prenatal care. Every CDH baby is different, there is no way to predict the outcome of any patient. Some babies with no diaphragm and little lung growth have survived, while some babies with full lungs do not. These children are very different, requiring different treatments, and varying amounts of medical support. Like the CDH logo or want to purchase some CDH Awareness items? 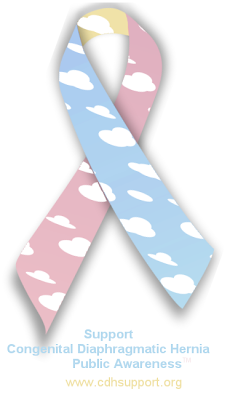 Make sure to visit CHERUBS Store where you can buy 100’s of items with the Official Congenital Diaphragmatic Hernia Awareness Ribbon, the CDH logo, the CDH Anatomy shirt and much more. A population-based study of congenital diaphragmatic hernia. – Torfs CP, Curry CJ, Bateson TF, Honoré LH. California Birth Defects Monitoring Program, Emeryville 94608. Medical Research Society; Communications for the Spring Meeting of the Medical Research Society, held in conjunction with the Academy of Medical Sciences and the Royal College of Physicians, London on 28th February 2005 at the Royal College of Physicians, London. Texas Center for Fetal Surgery, Texas Children’s Hospital and the Michael E. DeBakey Department of Surgery, and Department of Pediatrics, Baylor College of Medicine, Houston, TX. Small lungs and suspect smooth muscle: congenital diaphragmatic hernia and the smooth muscle hypothesis. – Jesudason EC. Department of Paediatric Surgery, Alder Hey Children’s Hospital, Division of Child Health, School of Reproductive and Developmental Medicine, University of Liverpool, Liverpool, UK.